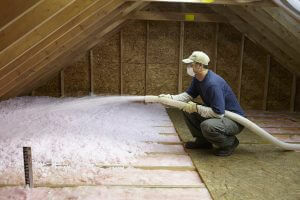 Protect your home in Georgetown with attic insulation that meets the new Building Code. decrease your heating and cooling costs by as much as 20%! VK Roofing is your Georgetown attic insulation installer. We are proud to be a certified Owens Corning insulation installer for Georgetown, Halton and Mississauga. We use AttiCat, Canada’s #1 inslulation brand. Care of your Georgetown home is our first priority. We will treat it like our own home. Drop sheets are put down in any area where our workers will be present. Attic space is prepared by replacing any old or ineffective baffles with new baffles where they are needed. All pot light backings (or other recessed lighting fixtures) are protected with special fire rated covers. A weather strip seal is added to the attic hatch so there are no gaps to let cold winter air in. Sheet Insulation is attached to the attic hatch to improve heat loss. Gauges (rulers) are installed to ensure an even R-value is blown into the entire attic space. Only after proper preparation do we blow AttiCat insulation into the attic space to bring the R-value up to R60, required by the Ontario Building Code (2017). We remove all our garbage and all debris is vacuumed from your home. A final inspection ensures that everything has been cleaned and put back where it was before the crew arrived. We know you have choices when it comes to insulating your attic in Georgetown, but give VK Roofing a try! Contact owner Anthony Van Kooten for a FREE No obligation quote for Georgetown attic insulation.